During my time as a school counselor, I have been surprised at how many school counselors are uncomfortable with the topic of self harm. In fact, I must admit that I have not always been confident in working with students who injure themselves. What made the difference in my level of confidence? Training, training, and more training! One of my first experiences with a self harming student was a young girl who disclosed that she was having issues at home. Although she never disclosed it, I believe she was inappropriately touched by her stepfather. One day, we were talking and she pulled up her sleeve and I saw a bright red row of cuts on her arm. I don’t think she was aware of what she had done and my eyes instantly focused on the cuts. Fortunately, she was open to getting help, but at first I was really nervous about addressing the issue. Of course, cutting is not the only method of self harm. One of the most extreme types of self harming behaviors that I have encountered was a freshman who banged her head on the table when she was angry. Her behavior was so out of control that we had to call her mother every time she lost control. Girls are not the only ones who self harm, but boys also exhibit self harming behaviors in not so obvious ways. I have seen boys burn themselves with erasers, hit their fist into the wall, and one diabetic student withheld insulin when he was experiencing depression. So my point is that self harming behaviors are not unusual or only behaviors experienced by girls. Let’s go into more details about self harm, self mutilation, or self injury. What is the difference between self harm and self injury? Self harm is an “umbrella term” that includes a number of behaviors that cause harm or damage. Researchers believe that self injury is used to relieve stress and feel relief. Self harm includes behaviors like drug use, eating disorders, and at-risk behaviors. The onset of self injury in students is between the ages of 11-15 and if left untreated can continue into adulthood. 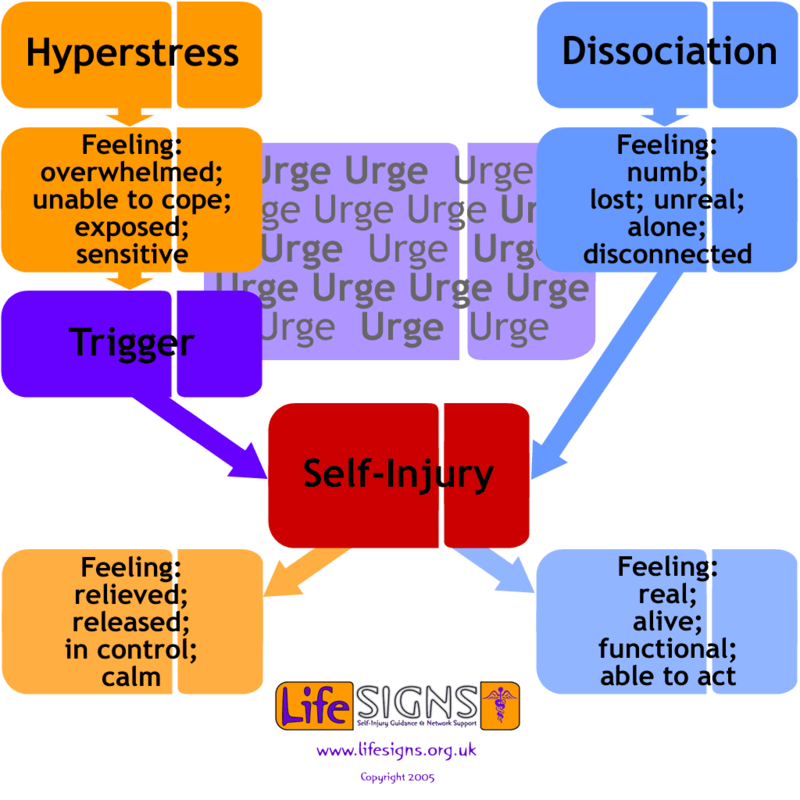 According to Lifesigns, self injury is a coping mechanism where the person harms their body to deal with their emotional pain or to stop the numbness by feeling physical pain. 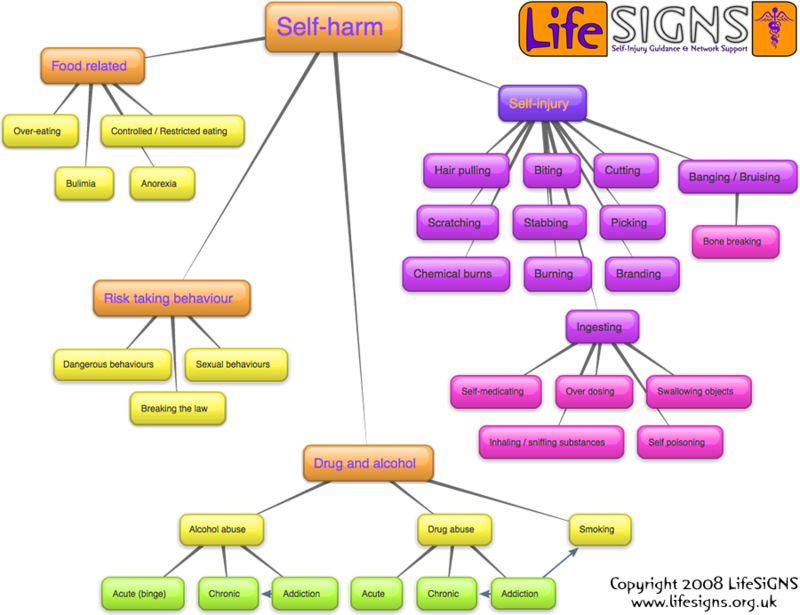 See the diagram below showing different methods of self harm. People who self injure are not just “weird” people who don’t know how to deal with life. Apparently, there is actually a science behind their chosen method to deal with stress and frustration. Most people choose to exercise, talk to a friend, listen to music, or play a video game to escape their problems; however, self injurers cope by cutting, burning, or hitting themselves. Because many teens who self injure have experienced trauma, the hippocampus which is part of the limbic system is impacted. The limbic system, which is responsible for emotions, releases neurotransmitters to produce endorphins responsible for the sensation of pleasure. The act of self injury causes the release of these endorphins which reduces the sensation of pain and produces a temporary high. Let’s say you go to the doctor and he informs you that your lab work comes back with a terminal illness. Immediately, you experience intense emotional pain (I would too!!). A few days later the doctor calls you and informs you that the there was a mix up in the lab results and you are not going to die!! Hip Hip Hooray…instant relief!! Not only is it instant relief that lasts for a moment, but it is emotional relief that lasts for days. This example demonstrates that there may be a similar correlation between emotional and physical pain relief. Therefore, there are some people who use the relief from physical pain to manage because traditional healthy methods of coping do not work for them. So, what’s the problem if this works for them? What’s the big deal? One of the biggest issues with self injury is the increased risk for non intentional suicide. Although teens are not trying to die when they self harm, they are at-risk for an increased rate of suicide. In addition, there may be an unidentified mental health disorder behind the self injurious behaviors, like depression or borderline personality disorder. People suffering from these mental health disorders often have suicidal thoughts and attempts. Therefore, if you have a student who is self injuring, it is important that you refer them to a mental health clinician. 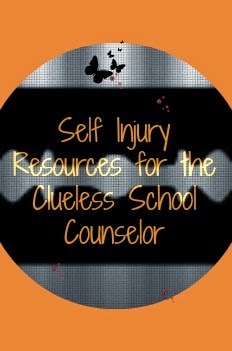 How Can School Counselors Help Students Who Self Injury? 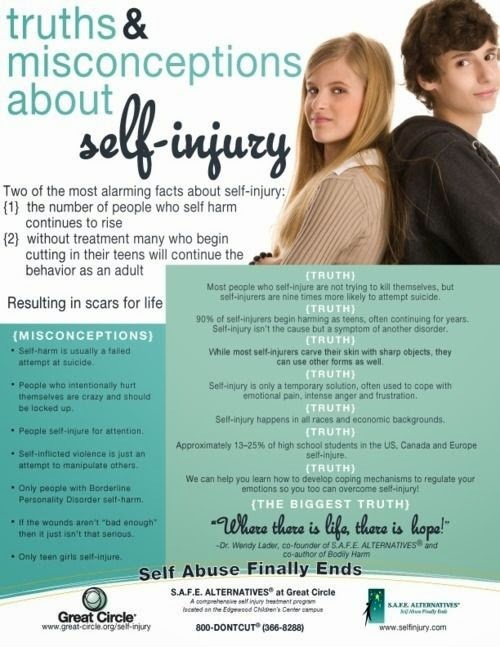 Although we cannot provide therapy to students who self injury, there are many ways we can help!! 1. 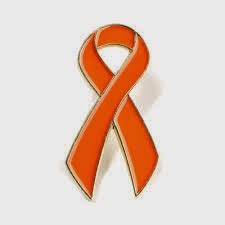 Provide awareness about self injury and educate parents, students, and staffs and the myths surrounding self injury. 2. 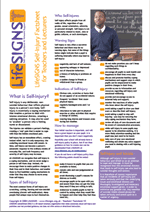 Know how to identify the precursors and signs of self injury. Before a student chooses to self injure, they often experience hyper arousal, confusion, and become overwhelmed. Next, there is a trigger or an event that upsets the student so much that they want to escape. The trigger is not the event that causes the behavior as the emotions have been building for days, weeks, or months. After the trigger, the student chooses to act and harms him or herself which then may lead him or her to a state of dissociation. In the state of dissociation, the student may often separate from life, emotions, and the body. A dissociative state is when the student becomes numb, unfeeling and can even experience a state of psychosis. 3. Listen to them! I can’t emphasize this enough!! Don’t act surprised or shocked, but allow the student to talk to you about his or her feelings and shame. Remember, it takes a lot of courage for someone to talk about his or her self injurious behaviors so it is helpful if you congratulate the student on sharing his or her secret with you!! 4. Help the student identify triggers and healthy distractions. 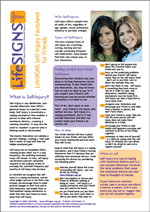 Lifesigns provides a list of healthy alternatives to self injury that you can share with your students who self injure. 15 minute rule – I really like this idea! For a duration of 15 minutes, the student should distract him or herself until the urge passes. Remember the term HALT or Hungry, Angry, Lonely or Tired. This is a term I use a lot for self care and it really works. If we don’t recognize our basic needs, we often get overwhelmed which causes us to implode or even explode. 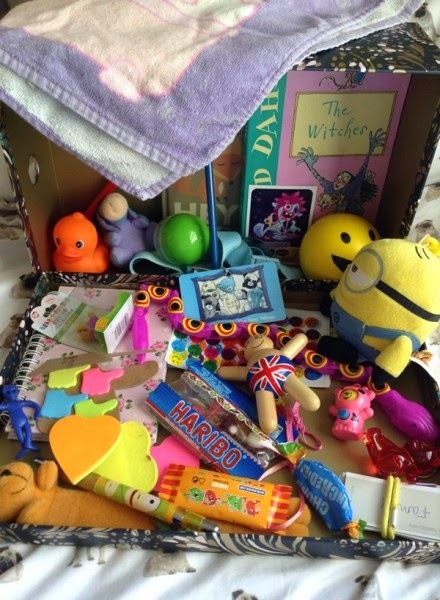 Create a distraction box with your students by filling it with objects to help them distract from the urge to self injure. Some object include: stress ball, chain of paper clips, rubber bands, blanket, or even lavender. 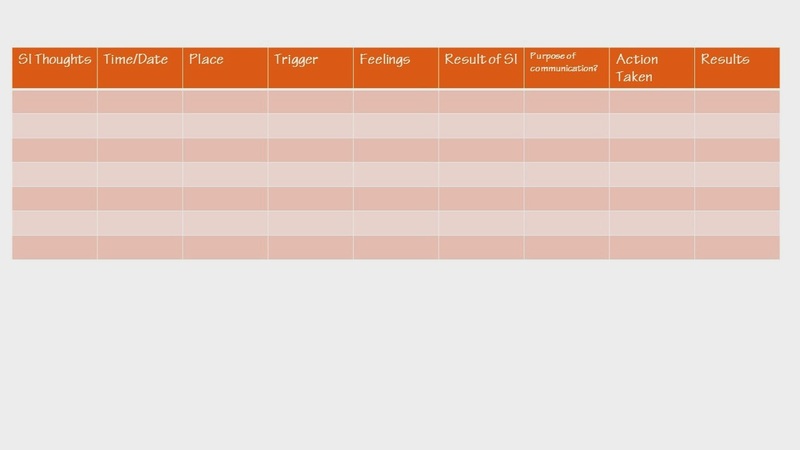 Impulse Log -help the student to monitor self injurious thoughts and behaviors. 5. 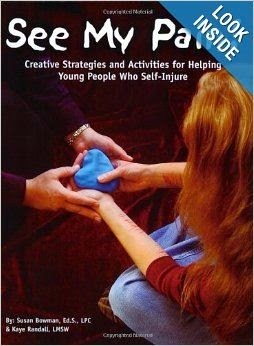 Help the parents and friends of those who self injure understand self injury. 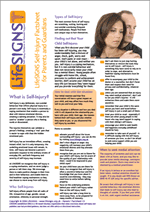 You can download lots of fact sheets and resources from Lifesigns. Massaging scars to reduce their hardness and vividness. Students should do this everyday. Use a moisturizer like Bio-Oil, Vitamin E, or Cocoa Butter. For raised, red scarring, students can use silicon strips. Camouflaging makeup from Dermablend for the body. This is a fantastic covering for scars, birthmarks, and tattoos. 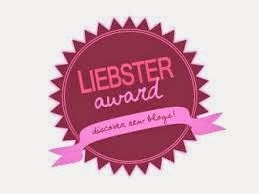 Check out this picture! Mindfulness, helping student appropriately perceive the thoughts and actions of others around them to reduce anxiety. 8. Get training!! 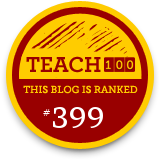 See videos and resources for school counselors below. No Harm Contract: The school counselor can make an agreement with the student that clearly specifies what behaviors will require the school to take action. For example, the contract may stipulate that the student may not bring sharp objects to school; limit self injury on school property; prohibit the sharing of sharp objects with others; or outline healthy distracting behaviors. 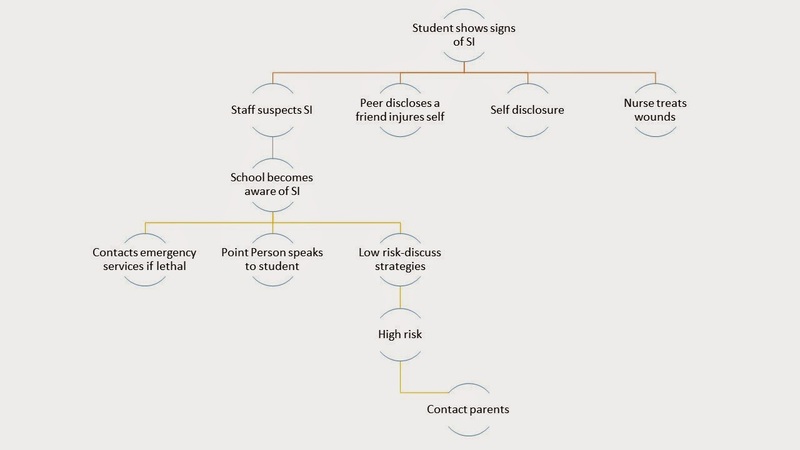 Develop a School Policy on Self Injury: A school policy can clarify any confusion about what is self injury and when it should be reported. 4. Outlines how to notify parents and their responsibilities. Counseling in schools should be done on an individual basis rather than in a group. Love to hear your ideas about how you work with students who self injure! !